GISS on: How Warm Was This Summer? | Wott's Up With That? “GISS on: How Warm Was This Summer?“. It was weather, not climate in Russia this summer! NOAA and NASA agree! Thanks Anthony. Sure Russian’s hot summer can linked to particular weather patterns. But what about the global climate? Hmmm. “Though calendar year 2010 may or may not turn out to be the warmest on record, the warmest 12-month period in the GISS analysis was reached in mid-2010.” – GISS director, James Hansen. Oh, I see. Nothing more than Anthony Watts’ regular cherry-picking. This entry was posted in It's Natural, The Cherry Orchard and tagged Misrepresentation by Ben. Bookmark the permalink. Come now Ben. You know perfectly well that 12 months does not make a year unless it’s the year you want. But, adelady, the warmest 12-month period in the GISS analysis remains mid-2009 to mid-2010 no matter what anyone wants. There are some differences in ranking over the measurement methodologies. NASA/GISS (the analysis under discussion here) posts 2005 as the record warmest, with 2009 tied with 1998, 2002, 2003, 2006 and 2007 in second place. In this analysis 2010 is scheming record warm: http://data.giss.nasa.gov/gistemp/2010summer/ , see figure 4. In the UAH satellite analysis 1998 still stands out als #1, with 2010 until and including September marginally second. This analysis has shown some (over-)sensitivity to Niño/Niña although that connection seems to break somewhat over the past few months. What is clear from all analyses is: general warming; a look at decadal averages suggests actual accelaration of this. 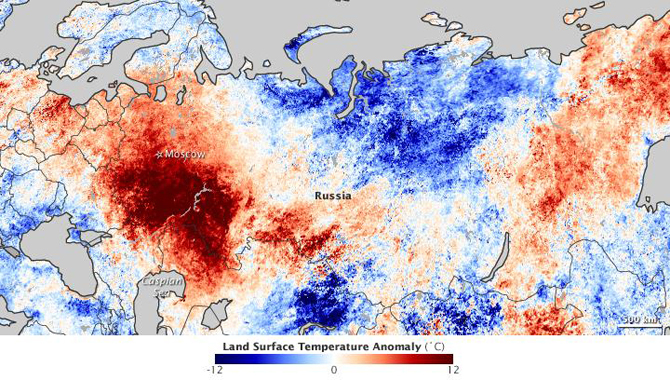 Oct2: NASA Goddard says the Russian heat wave is roughly half (weather) and half (would not have happened at pre-industrial CO2 levels). The exact words are at the end of the article. NASA Goddard’s statement is a stronger distinction than the usual we-can’t-be-sure-if-any-single-given-event-is-due-to-global-warming. I personally am uncomfortable with delving into nitpicking gray nuances of in-between situations and statements. But this single event ambiguity will be recurring, at an increasing rate. Fussiness is appropriate here. So I must hereby proclaim that Anthony’s good-humored choice, “sort of”, doesn’t stretch to “a half”. This makes his statement wrong. There is some Wegman goodness at wuwt. woot. Thomas Fuller twice describes his WUWT Guest Posts as ‘opinion’ pieces, in Keith Kloor’s comments, #27 & #46, here. This special ‘opinion’ status apparently permits the blatant misdirection towards MBH,1998. Thomas Fuller never mentions that the controversy concerns the Wegman Report’s plagiarizing of Raymond Bradley’s textbook: Palaeclimatology: Reconstructing Climate of the Quaternary. Last Thursday George Mason University announced that there was a committee investigating plagiarism and misconduct charges. Bradley’s publisher expressed an interest in his content plagiarized into the Wegman Report, and subsequently plagiarized again, into a book. “Some litigation is underway,” says Wegman. Thomas Fuller apparently doesn’t think there is any plagiarism of Bradley. And he minimizes the plagiarism of social networkj analysis. Deceptively, Fuller presents six separate definitions of the same thing to show their obvious similarities. Of course there would be no reason for other parts of these papers to be as similar. This is an attack-the-messenger-with-irrelevancies opinion piece that seems unaware that the Wegman Report story has moved on…to the investigation stage, both academic and legal. The factually challenged incoherent comedy of errors, deliberate misinformation and propaganda from Anthony just keeps on coming like an endless stream of from a broken sewer main. heystoopid……….It will never end. After the Arctic summer sea ice measurement becomes the number of weeks without ice, Anthony will still be applauding the November freeze-up. Gerald Meehl guarantees that despite an increasing rate of record high temperatures, there will always be some record cold temperatures. So Anthony’s weather-not-climate pieces can continue. And he’ll always be able to lay in a pro-AGW Press Release, under a snarky title, and the same commenters will still rise like alligators to a chicken. Its too soon to tell if (presenting science) Steve Goddard’s replacement by (giving opinions) Thomas Fuller is representative of the denier’s difficulties with the science, or just coincidental. Steve Goddard had the advantage of apparently (until his misstep would be recognized) proving something in each article’s step-by-step presentation of the science. Thomas Fuller’s opinion pieces will escape detailed or scientific scrutiny. But they also lose the chance to be convincing. I don’t want to take this analogy too far. And I note that the increasing coverage of energy issues on WUWT (by Fuller) is another retreat from climate science coverage.